Most of us can only hope to assemble an outfit that figuratively lights up a room, but the multimedia artists at Visual Drugstore make suits that achieve that lofty goal in a more literal fashion. The Light Muses are performers who share the stage with VJ/artist Mar-K.os at live performances. Their glowing suits provide audiences with an incomparable experience as they create a separate visual layer for every performance. When they move and dance in their lighted costumes, the Light Muses truly look like creatures from another planet. 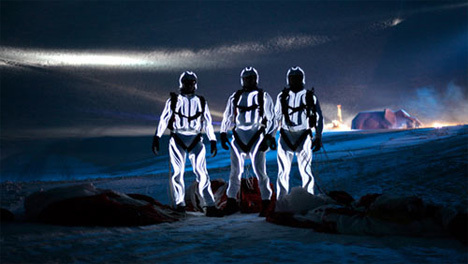 Visual Drugstore also designed these lighted costumes for Red Bull’s skydiving team. The Skylighter suits are similar to those worn by the Light Muses, but the faces of the skydivers are left exposed. 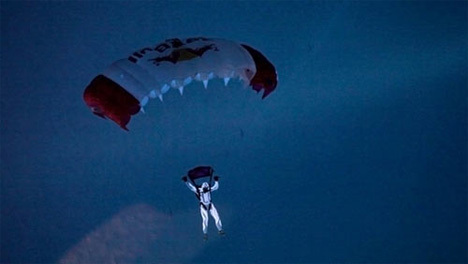 In the video from an event in Sweden (watch it here), the divers look remarkable falling from the dark sky. Their light-covered suits are even more impressive than those of the skydiving Elvises in Honeymoon in Vegas – and that’s not a comparison we make lightly. See more in Art of Tech or under Technology. January, 2013.